Williams Jet Tenders, the world's leading jet tender manufacturer, is looking forward to exhibiting its newly upgraded Dieseljet 625 model at the 2015 Monaco Yacht Show - the same model recently delivered to the family trust of Formula One's Eddie Jordan. Hand-built to the highest specifications, the Dieseljet 625 comfortably carries 11 people, and is powered by a 180HP Yanmar 4BY3 Diesel or an optional 260HP Yanmar 6BY3 Diesel 'S' engine, capable of reaching speeds of up to 48mph/71kph. Offering a beautifully sleek ride, the deep hull and ample space make for a smooth passage even in choppy water. Stepping aboard is safe and secure as the Dieseljet 625 has been designed to be supremely stable at rest. The model benefits from major investment into Williams' Dieseljet range, with upgrades designed to make these highly popular models even more versatile, practical and stylish. Fully embracing digital developments in the superyacht sector, the new range benefits from Williams' first ever completely digital dashboard. Williams has partnered with marine electronics specialists, Raymarine, to develop the innovative dashboard which, when coupled with the Raymarine chartplotter option, offers customers even greater connectivity. All four models in the Dieseljet range feature a new deck, designed to accommodate a modified forward boarding position, offering even greater stability. Styling updates to the range include carbon fibre inlay on the dashboard, a new premium steering wheel and ski pole as standard. New lifting point positions make fitment even easier for superyacht owners and additional practical touches include new tube steps forward as standard, optional boarding poles and a free draining cockpit floor. Mathew Hornsby, Sales Director at Williams Jet Tenders, commented: "We are looking forward to Monaco Yacht Show, which is always a real highlight of the superyacht calendar. We will be showcasing the upgrades recently made to the Dieseljet range, with our new 625 model on display, and look forward to hearing our customers' reaction to design touches like our new digital dashboard. We'll be telling visitors more about our new Sportjet 400, the latest addition to our growing range." The Williams team will be on hand at the show to talk existing owners and visitors through the exciting 11-strong range, in particular the third Sportjet model which will be unveiled to the world at the Cannes Yachting Festival 2015. Powered by the Rotax 4-TEC 125HP engine, and capable of reaching speeds in excess of 45mph/72kph, the Sportjet 400 offers blistering performance and an exhilarating ride. Williams Jet Tenders is recognised as the world's leading manufacturer of jet-powered tenders. The company has developed strong relationships with leading yacht manufacturers including Princess, Sunseeker, Fairline, Azimut Benetti, Ferretti, Oyster, Jeanneau and Beneteau - with many models being specifically designed to accommodate a Williams tender. 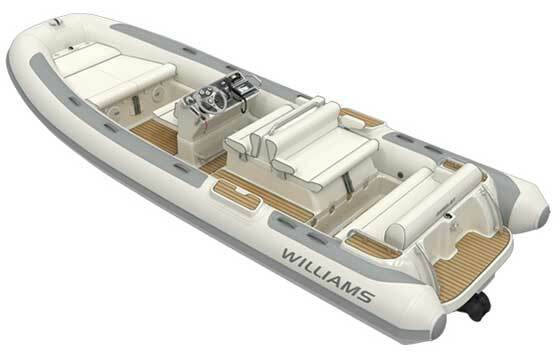 Williams produces over 700 boats per year.